Vivo is planning to introduce it’s next gen smartphone under the Vivo V series. The next device from Vivo under the V series will be the Vivo V15 and the Vivo V15 Pro. 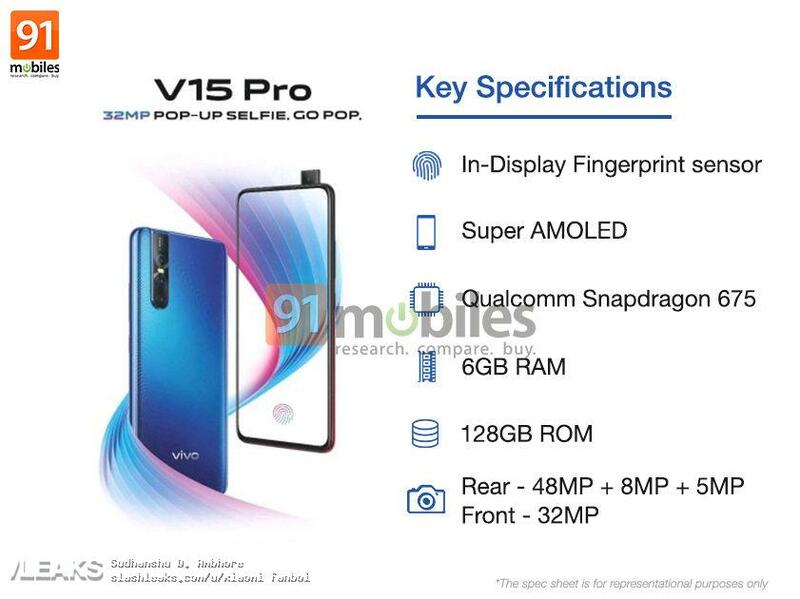 The upcoming Vivo V15 Pro is now leaked online in poster and promotional material. The leaked poster clearly indicates that the device will come with a pop-up camera on the front side. It will also be powered by an Octa-Core Qualcomm Snapdragon 675 mobile platform. It will have a triple rear cameras with 48MP+8MP+5MP of sensor sizes. The device will have a display on 6.59-inch with Super AMOLED panel.